Entering from the covered porch this one room suite leads you into a lovely French Country luxury. 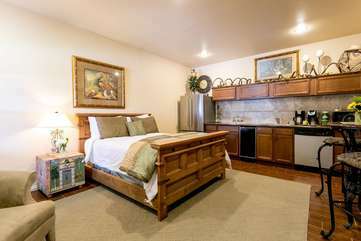 The queen bed is the focal point of the room and faces the flat screen television. A comfy chair is placed for reading or watching the television. The kitchen is also found in this room with large refrigerator, microwave, dishwasher and coffeemaker. A bar height table for two is conveniently located in the kitchen area. The bathroom has a large shower. To the left of the house is a private patio area for guests to enjoy. We stayed in the lower suite. It was an awesome place. I was most impressed how clean it was. My husband is disabilied and the owner was most helpful to call her brother in law to help get him Off the floor and into a chair. I highly recommend Elizabeth House.